Welcome to “Debarking Pet Myths,” our monthly series that addresses common myths, misconceptions and old wives’ tales about dogs and cats. Advances in genetics and related technologies have allowed scientists to analyze DNA and sequence the genomes (the complete set of genes) of several members of the cat family, including tigers, lions, snow leopards, jaguars, leopards, wildcats and domesticated cats. Their studies have produced some interesting findings. In a study published in 2007, scientists examined DNA belonging to nearly a thousand wildcats and domestic cats from different regions of the world. Their goal was to determine which subspecies of the wildcat Felis silvestris, a small cat compared to lions and tigers, was the most likely ancestor of house cats. The results revealed five genetic clusters, or lineages, of wildcats. Four lineages corresponded with four of the known wildcat populations that lived in specific regions. The fifth lineage included not only the fifth known wildcat subspecies but also the hundreds of domestic cats that were sampled, including mixed-breed and purebred cats from the United States, the United Kingdom and Japan. These findings indicate that F. s. lybica (aka the African wildcat) is the common ancestor of all domestic cats. The real surprise? African wildcat DNA — which was collected from remote deserts in Israel, the United Arab Emirates and Saudi Arabia — was virtually indistinguishable from the DNA of pet cats. 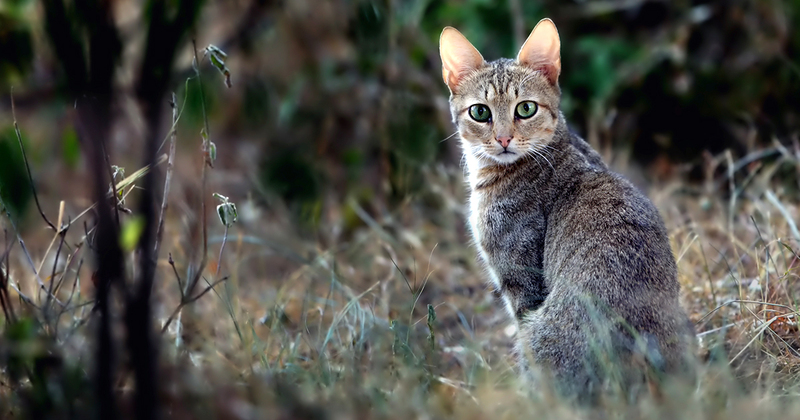 In fact, if you were to spot an African wildcat in its native environment, you might think you were looking at an outdoor or feral domestic cat. So, we now know our cats are descendants of a species of small cats, not one of the big cats. However, our kitties are still related to the big cats — especially tigers, the largest of the world’s big cats and one of the most fear-inspiring predators. A study published in 2013 found that our pet cats share 95.6 percent of their genome (DNA) with the Amur tiger. For comparison, humans share about 99 percent of their DNA with chimpanzees, which makes those primates our closest living relative. As a result of the research into cat genetics, experts now recognize 41 cat species worldwide, which led them to revise the feline family tree in 2017. There’s still a lot to learn about cats, big and small, and their evolution. Scientists believe big cat and small cat lineages diverged from a common ancestor about 11.5 million years ago, with the big cat lineage splitting off first. Groups of closely related cats continued to diverge until 4.2 million years ago. The most recent was the “domestic cat lineage,” which is composed of small cats belonging to the genus Felis: the wildcats, sand cat, jungle cat, black-footed cat and our pet cats. It’s true that your feline friend has plenty in common with the wild big cats. In fact, based on what is currently known, they have more in common than not. Stay tuned for more about the similarities and differences of big and small cats in an upcoming post!